Cailey Clark is a young ecologist passionate about social transformation through fostering connection to the land. During her time at Dickinson College, she focused on “Sustaining Ecosystems” with special attention on ornithology, forest dynamics, and food systems. 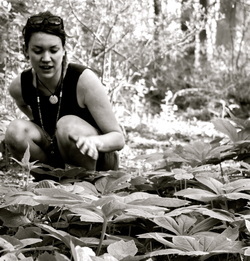 While taking her PDC with Sowing Solutions, she recognized the connection between these three passions, and spent her final year in school designing and implementing a native food forest/labyrinth modeling natural canopy gap succession. After spending a year studying in Kenya and Tanzania working with farmers in dry land areas, she recognized the potential and need for permaculture reforestation design and will soon be returning to Northern Kenya to build a training center with Sadhana Forest. For the past several years, Kyle has gathered experiences like mosaic tiles: permaculturist, carpenter, baker, resident assistant, educator, writer and editor, farmdener, student, and traveler. 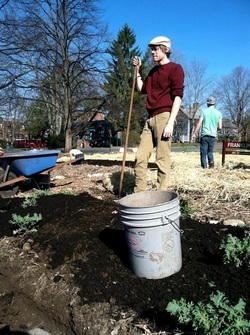 As a senior English major at UMass Amherst, he stumbled on the brilliant and curious permaculture community. In 2011, he joined the UMass Permaculture Committee and, wanting to further his learning, took a PDC with Sowing Solutions that winter. The impetus to pursue more permaculture opportunities and continue connecting with inspiring, conscious individuals hasn’t stopped since—to date, Kyle has worked on permaculture farms in Costa Rica, Florida, Georgia, Louisiana, and Massachusetts. He is tremendously grateful for the hands-on permaculture work he currently does at Wildside Gardens in Conway, MA, where experiment, learning, play, and enjoyment of nature are highly encouraged. He also teaches a permaculture workshop at his former high school in Greenfield, MA, and is gradually becoming involved with various writing projects in the field. He is incredibly excited to be finding opportunities that merge his loves of permaculture, writing, and teaching. Ultimately, Kyle seeks to direct his work toward community-building, people care and earth care, personal enrichment, turning problems into solutions, and an overall “leave it better than you found it” attitude.